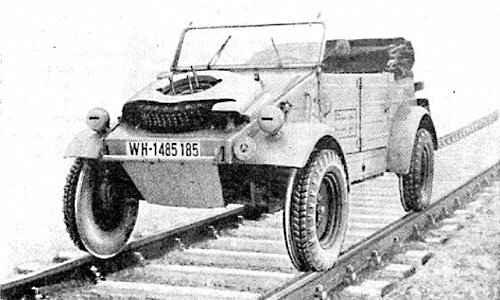 In 1944, Rüstsätze, or upgrade kits for VW Kubelwagen Types 82 and 87 were developed, which would make them schienengängig or railgoing. This conversion, designated VW Type 157, consisted of discs that were fitted to the insides of the regular road wheels. Spacers were added as necessary to match the track gauge. Thus the tires sat on the rails, providing propulsion, and they were kept on the track by the discs. The rear axle was fixed with a set of Anschlagkeilen, or stopper wedges, to keep tension on the rear wheels to keep it on the track.